Looking east over the vineyards at Brys Estate to the frozen surface of East Bay. It was a beautiful weekend on the Old Mission Peninsula. 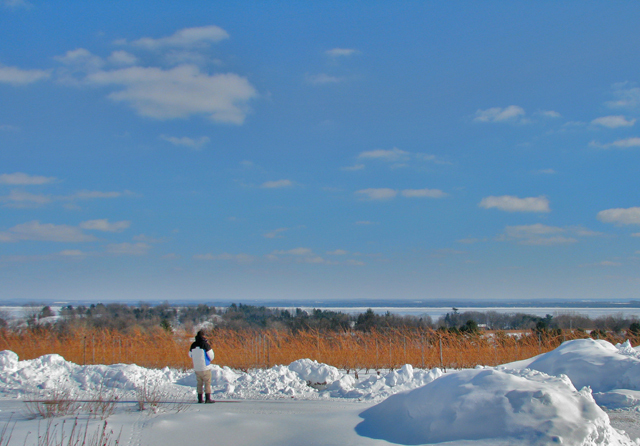 Blue skies were punctuated by an occasional flurry of snow, and Grand Traverse Bay was frozen solid: a sheet of unbroken white, bordered on each side by the milky blue hills of the mainland. Lovely weather for a little wine touring, in fact. 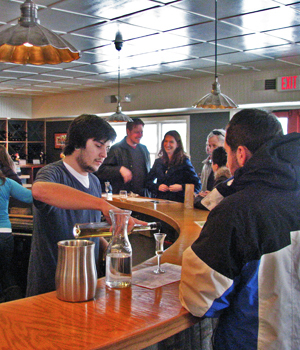 Of Traverse City’s two wine-growing peninsulas, Old Mission is smaller and more easily encompassed in a single day: just a little under 20 miles from end to end, and in places as little as a mile wide. 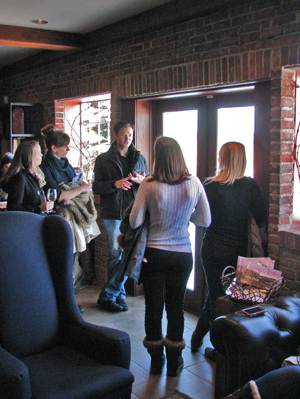 Seven of its eight wineries are open in wintertime (the newest, Hawthorne Vineyards, is closed until spring, unfortunately) and that’s just right for a little viticultural adventure. The peninsula’s main thoroughfare is Center Road (M-37) which winds north from Traverse City through a landscape of steep hills and elegant homes. At the north slope of the first big hill is McKinley Road, where you’ll find the Old Mission home of Black Star Farms. Here, in addition to the fine wines you’ll encounter at Black Star’s main winery across the Bay, there’s a wide array of distilled brandies and eau de vie available for tasting and sale. We tried the apple brandy and the red grappa, which were both excellent. Checking out the grappa at Black Star Farms. Just a few hundred yards to the north, at the top of the hill, there’s a wonderful scenic overlook with splendid views of the east and west arms of the bay—and the sprawling vineyards of Chateau Grand Traverse, the first winery established on the Peninsula (way back in 1974). They’re famous for their Rieslings, in particular. Keep heading north a few more miles until Blue Water Road, where a quick right turn leads to the Brys Estate vineyard and winery. Walt and Eileen Brys opened this charming winery in the summer of 2005, and has already acquired an international reputation for its wines. We arrived to hear their son Patrick giving a talk about grape-growing to a group of wine-tourists, and had a chance to taste their 2013 reds – very impressive! Back on Center Road, it’s not very far to the small village of Mapleton, where the Bowers Harbor Road takes a steep plunge to the west and winds its way to Bowers Harbor Vineyards, where the Stegenga family have created an intimate vineyard and tasting room that almost feels as if you’ve stepped into someone’s home – complete with an enormous Bernese Mountain Dog named Brix. I’m a fan of their Chardonnay. At the bottom of the hill is the Mission Table/Jolly Pumpkin brewery and restaurant. It’s not a winery, but they do have a nice line of wines under the Bonafide label, made for them by Peninsula Cellars. We stopped in to chat with our favorite Saturday tasting-room server and to sample Sakura, their intense distilled cherry spirit. Amazing. Kids playing pick-up hockey on East Bay. Head back up the hill and continue north on Center over a razor-thin bluff that we call the Hog’s Back. Just up ahead: Chateau Chantal, another winery that also doubles as a bed & breakfast. Even visitors who aren’t particularly interested in wine can appreciate the chateau’s evocative architecture and awe-inspiring hilltop views. Bob and Nadine Begin opened this gorgeous place in 1993, and their daughter Marie-Chantal Dalese (for whom it was named) is now the winery’s marketing director – and just gave birth to the third generation of the family last week, a grandson named Luca! The next road to the north (just past the Methodist church and cemetery) is Lad Road, which will take you to 2 Lads Winery, an ultramodern structure of glass and steel that enjoys a splendid hilltop view of East Bay. Owners Chris Baldyga and Cornel Olivier opened this cutting-edge winery and plan to concentrate their energies on producing “bold” red wines, but their whites are every bit as good. 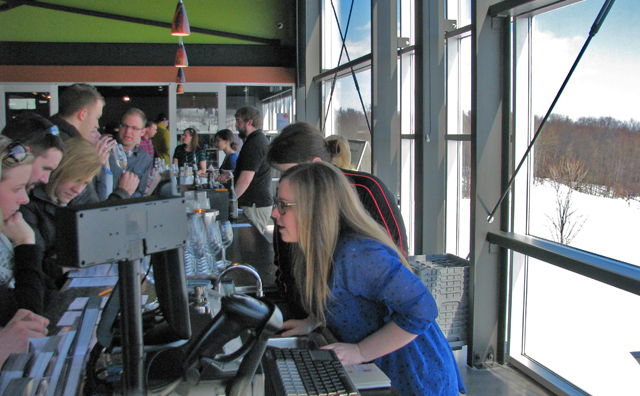 Lots of other people felt the same way this weekend, because that tasting-room was packed!